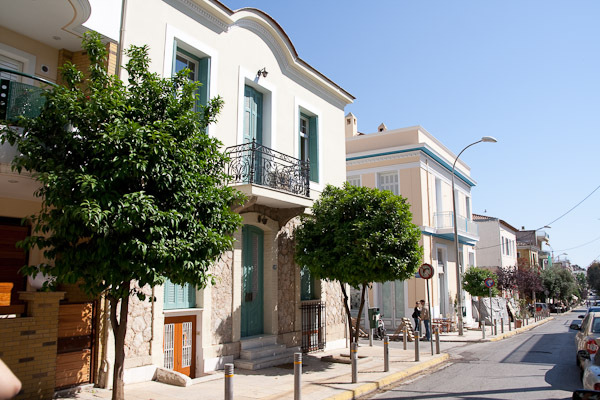 A walk to Troon Street – out and about in Athens » Along, Filopapou, Acropolis, Sunday, Here, Troon » tobias cooks! If you have some time on a Sunday, it is nice to go for a walk to Petralona, crossing the Filopapou hill. 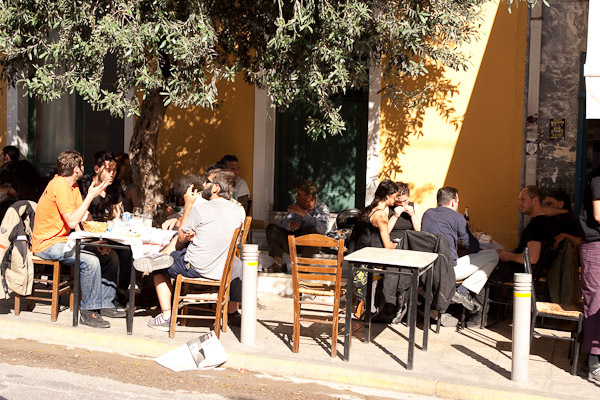 You will find nice architecture, a great ice cream shop, a quiet time and the best of all: you will end up in a little street that has plenty of nice tavernas - Troon street or Οδός Τρώων. The starting point of the walk is the Hadrian’s Arch. 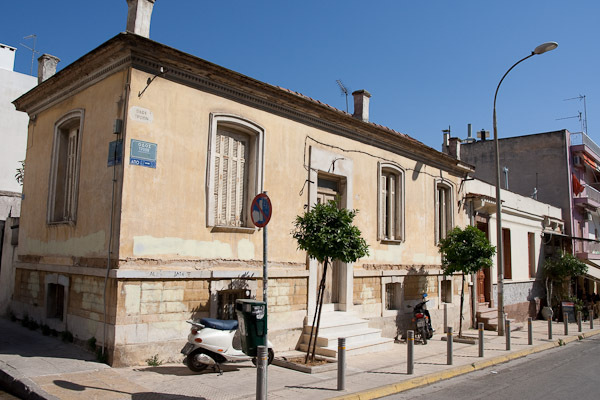 There the Dionysiou Areopagitou street starts, which is the longest pedestrian road in the city of Athens. 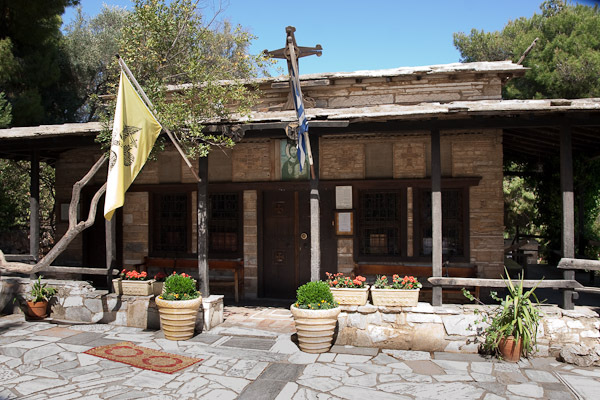 It leads you right to Thissio and Monastiraki. Here, in this little “Gelato” place fresh ice cream is produced every morning. You can find a great variety. 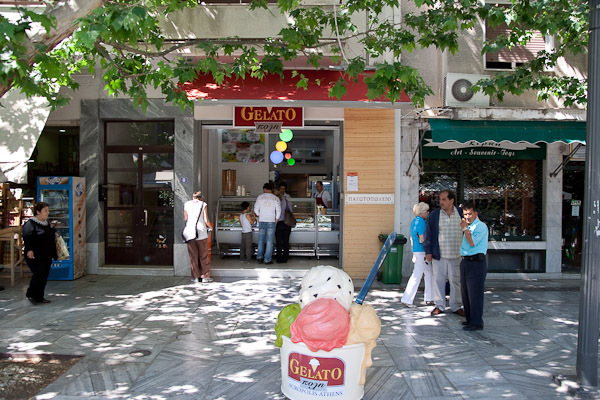 Gelato’s ice cream is in my opinion the best in town, give it a try! 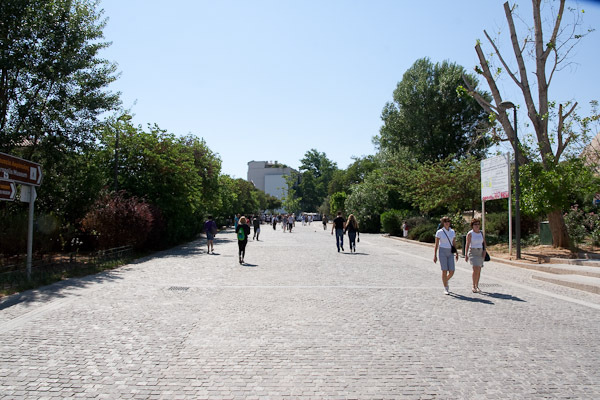 A wide pedestrian road leads you towards the Filopappou hill. 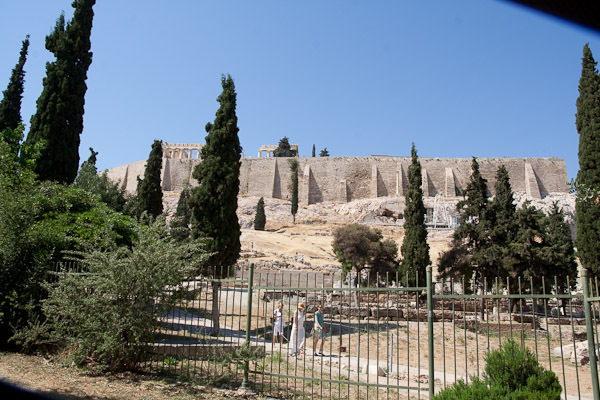 You leave the Acropolis Metro station to your left…. …and the Acropolis to your right. Along the street you will find beautiful buildings form the late 19th century. The street takes a right turn to Thissio. If you keep walking straight though, it will lead you into the park of Filopapou. 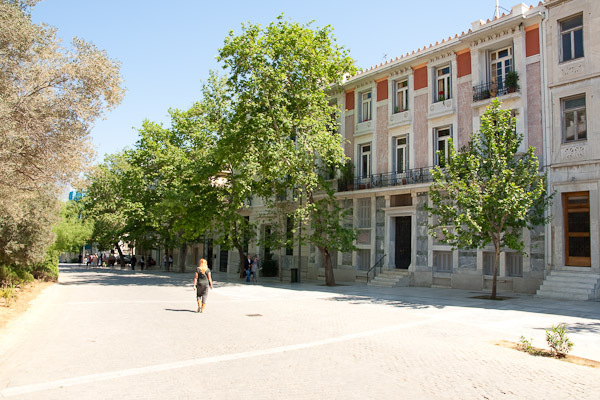 The park of the Filopapou hill is a beautiful green oasis in the center of town. You should make a stop at the small church that you will find to your right after a few hundred meters. Take a rest in the shade and stroll around the terrace behind the church. 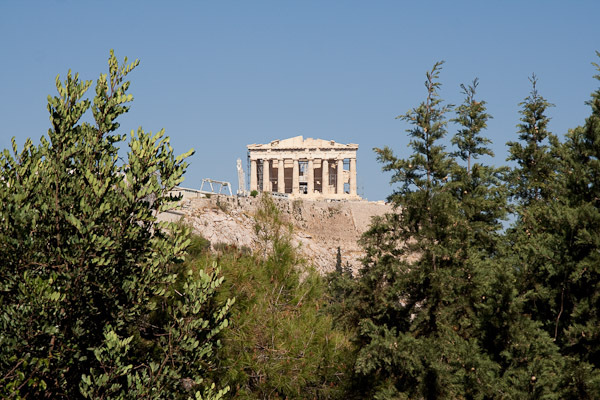 You will get a stunning glimpse of the Acropolis from there. Continue the walk towards the south side of the hill. It is easy to navigate as you can see the sea from there. This is the direction you want to be heading. 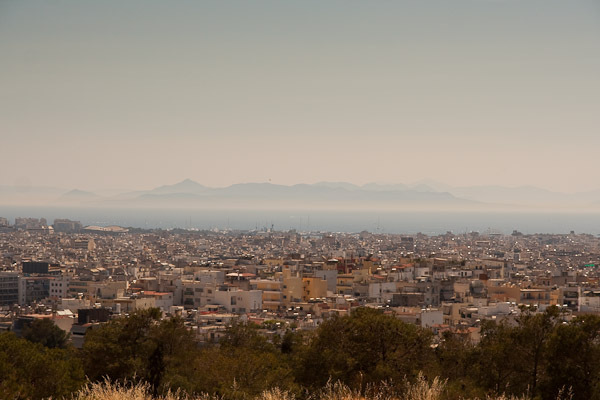 Here a view over Syngrou, Kalithea and palaio Flairo, in the back the Aegean Sea and the island of Aegina. If you’ve read “Logicomix” p.21 you might recognise the view! Having reached the bottom of the hill you will cross Arakynthou street. Keep right and pass the long stretched building. Along the right side of the building there is a little path heading down the hill. Follow it. The second parallel street you will hit is Troon Street. You are now in Ano-Petralona. Along the street are small old houses and plenty of Taverns. On a Sunday afternoon this is a busy neighbourhood. If you are looking for an Ouzeri, a Mezedopoleio, a Tavern…here you can find it all. Everyone is out enjoying their food and drink. Once you have found a table the friendly hosts make sure it is getting filled well. It is not a very known fact, but the Greeks love drinking Raki or Tsipouro. Both are basically the same thing, a clear distill from grape, that is offered with or without a flavour of anise. The name varies according to where you are in Greece. It is served chilled. 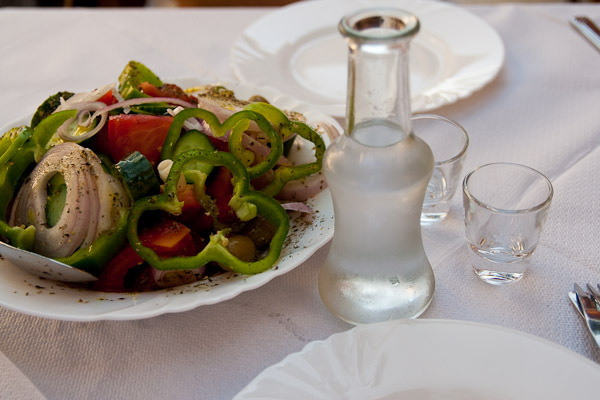 Tsipouro, as much as Ouzo is consumed with food only. Traditionally you never just drink it by itself. 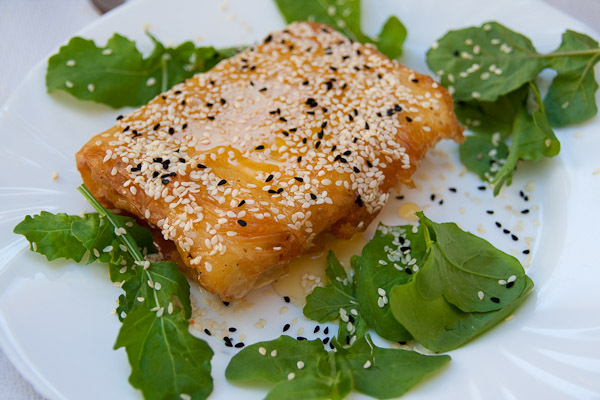 In Our case it is served with the speciality of the house: Fried feta cheese with honey and sesame seeds. Tobias, this is also my favorite walk. I was there on Friday together with my 3 years old son. It is so nice. What a wonderful walk, I love the photos!